Google added new features that allow Android Apps running split screen on a chromebook. It has been a great work from Google to have been able to accomplished these wonderful features. Google now allow you to easily put two windows or web app side-by-side on Chromebook. This was a welcome improvement, particularly on convertible machines with a tablet mode. Unfortunately, it didn't apply to Android apps before, but that functionality has now been added to the Chrome OS Canary channel. Chrome Story first noticed the code change in the Chrome OS repository that suggested this was on its way. There wasn't any further evidence at that time, but now Chrome Unboxed reports that Android app split-screen snapping is live in the bleeding-edge Canary build of Chrome OS. You'll need to be running Canary and have the "enable-tablet-splitview" flag turned on for this to work, but be careful as that channel isn't especially stable and isn't recommended for daily use. 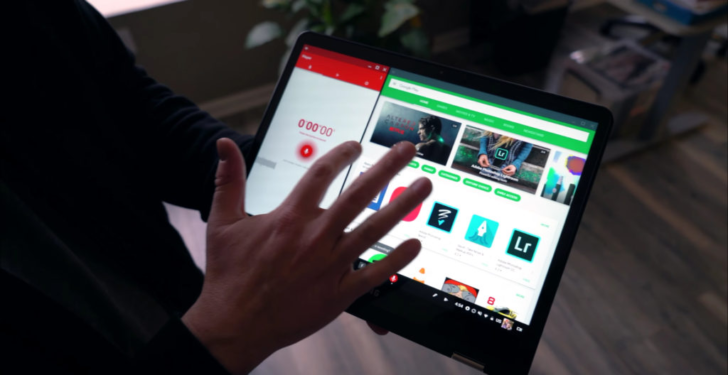 It's thought the feature could hit the stable build around version 65 or 66, which should line up with a number of new detachables and standalone tablets entering the Chrome OS space.